More than 10% of air conditioning (air con) gas permeates from the air con system every year, reducing the efficiency and impeding its operation. Manufacturers recommend air con systems are charged with gas and lubricant every two years. This service is not part of routine vehicle servicing, so if your vehicle is more than two years old it is probably due for a recharge. Air con systems that are not fully charged will be less effective and will have to work harder. At Buxton Car Centre Service & Repairs, we offer a complete air conditioning recharge service and we can also clear the bacterial build up from within the system, which will remove any unpleasant odours and improve efficiency. 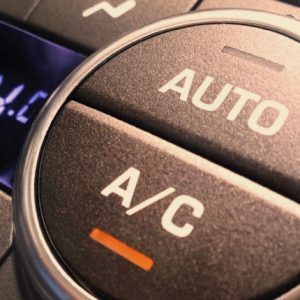 Air conditioning systems in vehicles work in the same way as a domestic fridge. Both machines use compressors to pump refrigerant gas around, but domestic fridges sit in a safe location where its complicated cooling mechanism is out of harm’s way. The same isn’t always the case with the air conditioning system in your car. A key part of it, the condenser, works in a similar way to the radiator, but it has to be positioned where it’s exposed to cooling air as it rushes under the front of the car, which means it can be prone to stone chips and impact damage. There are plenty of other places where this essential gas can leak from. Over time, seals in the system can grow brittle and porous, hoses can split and and stress fractures can develop in metal tubing, all which cause your system to work less efficiently and to ultimately fail. If you have noticed a change in the performance of your vehicle’s air conditioning system we can quickly identify and rectify any problems.